Look around you. What do you see in the people around you? They have a desire for what I have put in you. Demonstrate who I am. Reveal who I am. Walk in the fullness of who I am. I have been increasing your experience of Me daily so that you might trust and enjoy Me. Walk in the power and glory of who I am. Boldly pour out My love and share My word. Boldly demonstrate who I am. For you are the manifestation of who I am on the earth. You are the ones who will bring truth to a lost and dying world. Know this, they are hungry. I am showing you My glory and giving to you My unconditional love. Love for Me. Love for each other. And love for this world. Give My love to others. Receive My love. You have waited, searching for Me, searching for My face. Searching for wisdom. Searching for My desires. Searching for understanding. You have anticipated My presence, longing desiring wanting more of Me. Anticipate no more but step into My grace. Step into My wisdom. Step into My glory. For I have called you and set you apart for such a time as this. My longing and My desire has always been for you My sons and daughters. Draw near to Me. Step into My comfort and My peace. Step into My anointing. I am restoring that which has been lost and broken. Release My words of peace and joy. Know that you are more than a conqueror. You are My chosen ones, the ones I have sought after. You are the carriers of My word and My glory. To the Lord we say: We hear Your voice. We respond You are our choice. We will make a joyful noise. For You are our choice. You are our reward. The Lord says, My glory is for advancing My kingdom. Utilize all that I have given you as you come into the fullness of all that I am. As you continue to pursue My fullness, My glory shall manifest through you. The most glorious days lie ahead. Be prepared. Be about My business. Occupy until I come. Endure the hardness until I come. There is much I shall do in you and through you. Go where I send you. The Lord says, My sound is resonate in you. As you go about your day and release My sound it cause liberty to come into that place. For you carry liberty. This sound is not just for Sunday morning but this sound is IN you. It resonates in your DNA. It resonates in your heart. So open your mouth and release My sound. My sound carries victory. My sound carries My power. And My power is in you. So do not hold back but enter into My sound. You are My sons and daughters and as you go you release My life. As you go, I am with you and you are with Me. Together as one you will see My kingdom manifest in My fullness. My courage is rising up within you. Do not stifle it. I have placed upon your feet my word of peace. Wherever you go you carry My peace. My peace is with you, and My peace shall sustain you. This is a time of accelerated breakthrough. You are making a forceful advancement. And you carry the weapons of warfare. You will see great harvest. You will see the captives set free. So go forth. 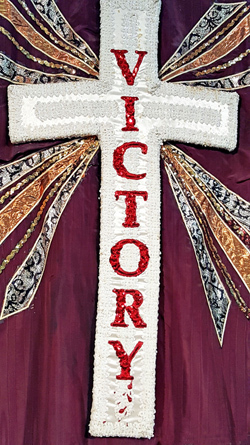 There is victory in the camp says the Lord. So go forth My chosen ones. Go forth My warriors. Go forth My worshippers, My sons and daughters. I have released you. My victory is in your voice. You will be strong. You will be victorious. The Lord says the heavens are open. The heavens are open. My children, I have OPENED WIDE the gates. So that you might come in; so that you might walk out of whatever is holding you back. There are no more limitations. Out of your belly will flow My river. The Lord says to Harvest, make Me the dominate image when you worship, so that when you go out you know how to find me. I will put My word in your heart so that when you are out you can release My word out into the world. The Lord says I have caused an underground river to be released here at Harvest. Allow that river to flow inside of you. And it will flow out into all of your environment. There are resources and health in this river. To this house the Lord says you carry the same DNA that is upon your Apostles. You carry a dimension of life. You are a company of people who carry into the city and region the manifestation of the pattern God has given to this house. You move as a team with synergy. You ignite the atmosphere with the frequency of your spirit making it conducive for God to move. You know how to move in the spirit. Don't be a spectator. Give your portion in worship. The Lord says to Harvest, keep on getting out in aisle and dancing. An ERA is defined as A NEW PERIOD OF HISTORY. In a NEW ERA everything is refined. Our thinking and perspective need to change so we can succeed and progress in what we have to do. Our culture has much to say about this NEW ERA and how things are gong to operate. God has even more to say. His order is above or supersedes the world’s order. God sets time and seasons into place. This NEW ERA is here because it is God’s timing. God speaks to us His prophetic word to help us understand the times and seasons He sets in place. This way we can live and move and have our being connected to heaven, not the world. Our source is God – not man or culture. Greater is He that is in us than he that is in the world. God always provides a way; God’s way is the way of holiness. He promises us He will make the way and enable us to walk in it. Lift up your heads, O you gates, be lifted up you ancient doors that the King of Glory might come in. Who is this King of Glory? The Lord mighty in battle. We must lift our heads out of circumstances, out of the old scenery. God enlightens the eyes of our heart so we can LOOK and SEE the REALM of VICTORY that we have entered. This is what the prophetic words bring to our attention. What is God doing? What is He speaking? What is He saying to me? How do we TAKE THE SPOILS? We are in a NEW ERA, a new time in history. We have not been this way before. We are not fighting battles like we used to fight. Our weaponry is new. We are NOT fighting to survive (that was the old season). We are engaging in battle to take back, to plunder, to annihilate everything about the enemy. Take back our families, take back cities, lop off the heads of giants, take the harvest of souls. We advance in VICTORY. EVERYTHING is in place. NOW is the time to advance. Below are excerpts of prophetic words spoken to us as a congregation over the last few weeks. Giving us instruction and understanding. Giving us keys in this NEW ERA, this new period of history. For there is a holiness arising in you. Literally, holiness is arising in this place. For there is a holiness that is arising as the standard, the standard of truth. For the Lord says, I AM that I AM. I AM that standard. I AM that truth. I AM that holiness. I AM that I AM. No weapon formed against you shall prosper. For I AM that I AM. Revival and truth shall be declared. For I AM that I AM. My wisdom, My glory shall abound for you. For I AM that I AM. 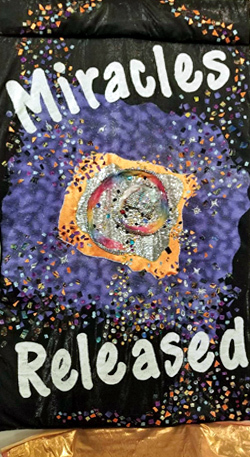 Release My truth, release My word, release My voice, release My glory – declare that I AM that I AM. As you begin to believe My word, even the very words that you sing, you will begin to see My manifestation everywhere you go. Because as I am in you, you are in Me. And as I move, you move. And as you move, I move. And together we will see My kingdom come on earth as it is in heaven. Together we will see the powers of darkness overthrown. My joy will emanate from you. As you go know that I am sending you. Together we are one. And if the Spirit of Him who raised Jesus from the dead is living in you, then He who raised Jesus from the dead will also give life to your mortal body. My Spirit lives in you. This is not a question but a declaration. Since the Spirit of God lives in you no longer shall you be limited, no longer shall you be in restraints. You are FREE in Me! My destiny is upon you. My life is within you. My word glorifies you. I have set you apart for such a time as this – to restore the broken hearted, to heal the sick, bring forth My word and truth. This you shall know: none is greater than Me! None goes before Me. I am King of kings. I am Lord of lords. So fully enter into My victory. Don't just look at My victory, but enter in! Step into the victory that I have provided for you. Step into the victory that I have given to you. For I have opened the door and said, “Come into this place.” In this place is My fullness. In this place is the fullness of My victory. In this place things are different, circumstances and situations will look different. You will hear things differently. You will speak differently. When you are fully enveloped in My victory you will no longer be intimidated. You will no longer stand in fear. There will be no confusion in your heart or mind. You will not be perplexed. You will have clarity of purpose and clarity of what I am speaking, clarity of how I am moving. Step fully into My victory realm. I have opened up the door for you to enter into My victory realm. I am inviting you in. I say to you, this is My time for you to enter into this place. It is a new dimension and a new realm. It is a realm that I am introducing to you in this NEW ERA. So step into My victory realm. We have entered 2019 with expectation and the promises of God. Our spirits are alive. Nothing is impossible with God. 2019 will be a year of miracles and a year of birthing. The kingdom of God is advancing, and we are moving forward. There was much insight and direction given at the joint service New Year’s Eve with MDCC. Apostle Bob released a word sharing that Holy Spirit will teach us to run with endurance this year. To keep our eyes fixed on Jesus and to endure even when the going gets tough. Holy Spirit is going to disciple us individually revealing every hindrance that is holding us back. We are to lay aside every encumbrance as we are being trained in righteousness. As a church we are starting the year with a time of consecration, fasting for 21 days. Seeking God; allowing Him to search our hearts. Apostle Linda shared that a key scripture for 2019 is Titus 2.11-12, “For the grace of God has appeared, bringing salvation to all men, instructing us to deny ungodliness and worldly desires and to live sensibly, righteously and godly in this present age.” We are to establish the culture of heaven. In this time of consecration you will revelate My glory. I am strengthening you. Shaping you. We responded: The time is here. The time is now! With one voice we make Your sound. We take our place. The miracles of God have already been released from heaven. The miracles must be received by faith. They are apprehended by believing. Your faith will remove what has blocked you from receiving what I have already provided. Have I not said that by the stripes of Jesus you have been healed? But what are you saying? What do you believe? Whose report do you really believe? No longer say someday miracles will come. Rather say, TODAY miracles have come! TODAY when you hear My voice do not harden your heart. Believe. If you will press into My Spirit this season I will press out of your soul that which has hindered you from the fullness of all that I have called you to be. I have called you to be more than a conqueror. I have called over to be an overcomer. I have given you My Spirit and My word. This is a season of grace for change, a season of great breakthrough. It is a season that your expectations will arise. Bubbling up inside of you is a supernatural hope, a new hope. A supernatural joy and a supernatural strength. Miracles are here. I am the God of the impossible. Is there anything too hard for Me? There is nothing too hard for Me! All you have to do is respond in faith. Miracles are your portion and miracles are your inheritance. Believe. Look to see. Receive. Do not say, I cannot be healed because of this or that. Breathe Me in. I am here to heal you and restore you. You say to Me, Lord this world has become so fearful and anxious. But I say to you, you have never been this way before. I am dealing with familiarity and tradition. I am saying to you that this is a season you will not find security in things. I want to be your complete security. You are walking into newness of life. You are being led by My Spirit into new dimensions that you have not entered before. The old securities are crumbling and a new security in Me is coming forth. For what is it that perplexes you and causes you to reason? Am I not with you? I will never leave you. If you turn to the left or to the right, am I not there? If you look to the left or to the right am I not with you? For even though you walk through the valley of the shadow of death, you will fear no evil. I am your rod and your shield. I am your protector. I am your comforter and strength. The surety of the Lord goes before you. My grace is with you. My word is with you. Do not hide yourself. You have been set apart and chosen. I am your God and you are mine, so go forth. Rejoice and know that I am with you. As you look around, you see your own government is shut down. And many are fearful and perplexed because they have put their trust in the government. But My government of peace, says the Lord, is standing. I have called you to work and cooperate with Me. You will shift and rise up as you put your trust Me. The presence of God, powerful prophetic words and preaching is taking us beyond where we have been. Our Farther continues to pour out His Spirit upon us. We are being enlarged and expanded. Everything has changed – we are a new creation in Christ. Finish 2018 strong so that you can enter 2019 strong. Be filled with faith. Stand strong and be filled with courage. Do not shrink back. Trust in the Lord with all of your heart. Hebrews 10.23 Let us hold fast the confession of our hope without wavering, for He who promised is faithful. Walk in partnership with God. It has always been God's intention to have us partner with Him. He wants to walk with us. He wants to equip us. He wants to give us understanding so that we know what to do and when to do it. God is NOT REACTIONARY. Recent Prophetic Words: Be strengthened. Be focused. Receive. Where My Spirit dwells, the I AM will be revealed. I AM the MIRACLE WORKER. I AM the PROMISE KEEPER. I AM the God that extends His hand towards you. Do not hold back this move of the Spirit. I will invite you into who I AM. I will abound in you. I am pouring My power into you. Do not resist. Surrender and receive My power. I am imparting My power into you. You carry My kingdom. You carry the dimensions of My Spirit. And I am bringing enlargement in you. This is a day of the miraculous. This is the demonstration of My power to astound the earth, to bring glory to My name. So do not fear and do not hold back. Do not say, I am not qualified or who am I to carry such a thing. I say you are Mine, and I have called you for such a time and place as this. Surrender, surrender to My power and My glory. I am filling you. As you surrender to My power and to My name – My glory will fill you. There will be a newness in your thinking and your speaking. It is because My kingdom has come to you. You have said what about my circumstances, what about my situations and problems? I say unto you, who do you say that I am? Am I not your God and King? Am I not your glory? So begin to step into My word. Step into My reign. Step into My arena. Release My kingdom and release My strength. Release My healing. Who do you say that I am? Glorify My name in your circumstances and in this world. Release My word with authority. You are My chosen generation. Stand firm in Me. Give yourself to Me and you will begin to see your circumstances and those things around you differently. I am with you. Give yourself to My workings and it will push out the doubt. It will push out the fear that you cannot do it. As you give yourself to Me understanding will come. I want you to become a miracle worker with Me. I want you to be the light in the darkness with Me. Give yourself to Me. Where is the wise man? Has not God made foolish the wisdom of the world? God has chosen the weak things of the world to shame the strong. Do not be afraid to look foolish to the world; the foolish things of the Lord are wiser than the wisdom of the world. For what sets you apart? What makes you unique? What is it that makes you My sons and daughters, My watchmen, My warriors? What is it that makes you a chosen generation, a royal priesthood? It is because you are willing to be set apart, willing to do My battle. The things that I say will be, will be. This is the hour and the time, this is the minute – this is literally the NOW! So step into My glory. Step into My wisdom. Step into My anointing. "This I will do" shall be your declaration. I am bringing you into My presence and My anointing and My power. I am removing everything that blocks you. I am purifying you. I am releasing a spirit of courage. Courage to face your giants. Begin to run toward your giants. I have put a word in your mouth, even as you go you will start to release the word. You will see the giants begin to fall in front of you. This is a time that I am releasing My presence in all of its fullness. Welcome the Holy Spirit. The same Spirit that raised Christ from the dead is at work in you giving life. This is your portion and your inheritance. Thank God for what He is doing. Thanksgiving opens the door for His presence. God says, I am releasing a spirit of understanding in My people. For My Spirit is wisdom. Clarity is coming where there is confusion. Receive. Receive. Receive My words. They are a fresh running brook. Walk in them. Speak My words they are Spirit and truth; they are real. I am giving you My word and My authority – take it. Do you need a miracle? Are you believing for a miracle? Do you want God’s miracles to flow through you? Do you want to pray for people and see the miraculous for their lives and situations? THIS IS GOD’S TIME AND SEASON FOR MIRACLES! FOR US TO RECEIVE MIRACLES AND RELEASE MIRACLES. I don’t know of anyone who is not believing for a miracle for themselves or someone else, or their work place or the city or this nation. NOTHING IS TOO BIG FOR OUR GOD. Only believe. The miraculous surpasses understanding and knowledge. Do not try to figure out the miraculous. Do not lean on your own understanding. Nothing is impossible with God. He is the God of miracles. Believe. Stir your faith. "I long to do miracles in you, and miracles for you and through you. Those around you are looking for miracles. I am raising you up and you will be known as a people of miracles. Everywhere you go you will release miracles. This is the hour of My miracle working power. My miracle working power is resident within you." Devour these prophetic words. Come into agreement with them. Receive them into your heart. Confess them with mouth. Step into the place of receiving and releasing the place of miracles that God has opened up to us. Be brave and bold. As you welcome My glory and sing about My glory, I hear it as ones who are yielding themselves to Me. I hear it as ones who are opening themselves up and saying, "Lord have Your glory". Is that what you are declaring? That is what I hear. You are a people saying, “Lord come and reside in us. Speak through us. Use us. Lord, thank You for transforming us.” This is what I hear. And you ARE a transformed people. Now I will have My glory. My glory is in you. My glory is being manifested in you as a FirstFruits. It is being manifested in signs, wonders and miracles. I am pouring out My Spirit in a fresh and new way. My glory will manifest. Receive your miracle. Receive healing in your body right now. Put your hands on your heart and declare My goodness and My love. Put your hands on your heart and receive your healing. Put your hands on your heart for I have made you pure. (Our response to what God just spoke to us) Pour out Your Spirit Mighty God. We put our hand on our hearts. You are my healing. We declare, "GLORY". God says, I am your glory and there is no one like Me. All that you need and all that you are – I am. You are my precious ones. I am pleased with you; so go forth in all of My glory. You are My chosen ones. A chosen generation. NOW is My season. NOW is My word. NOW is My glory. NOW is My release. NOW is My healing. NOW is My grace. NOW is My strength. Step into My glory. Step into My word. Step into My healing. Step into My strength. Step into My grace. You are My sons and daughters. Even as you sing that I am the God of miracles, I say to you – I am the God of miracles. I, the God of miracles, live on the inside of you. I long to do miracles in you, and miracles for you and through you. Those around you are looking for miracles. I am raising you up, and you will be known as a people of miracles. Everywhere you go you will release miracles. This is the hour of My miracle working power. My miracle working power is resident within you. Christ in you. As you cooperate with My working on the inside of you, you will begin to see that that you long to see. All of creation is waiting for My miracle working power to come through you in this hour. I have predestined you and set you apart, putting you in place. This is the season. This is the hour. This is My word. This is My life in you. For I have ordained you to be a chosen people, a chosen generation, full of force. Full of fury. Full of grace. Full of power. My word abides in you. My glory resounds in you. This is My hour and this is My time. I am strong in you. I glory in you. I am for you and not against you. I am your King. I am your Lord, and I am your God. For what I have said will be, will be. Whether it is in healing or it is in glory – this is your NOW time and your season. So go forth in Me. The prophetic atmosphere was very strong at Harvest the Sunday after many had attended Cross Immersion. At Cross Immersion there was fresh and deep revelation of the full gospel message. The presence and power of the Spirit of God was very tangible. In your heart you could sense that the Holy Spirit was doing a deep work in our lives. The Lord is strengthening our spiritual foundation. Faith is being refined in our hearts. We are not in a fight with the devil. He has been defeated. This is a FAITH FIGHT. Nothing is impossible with God. Only believe. Lawlessness is coming down. Sin is becoming weak and feeble. It is becoming easier to walk in the light of God and righteousness. God sets the times and seasons. And every time and season has governing dynamics that are important to understand and discern. The prophetic helps us to see and understand how God is moving – what are the governing dynamics at work. God’s word is the foundation of all of His creation. The Lord is shifting us out of futile thoughts – thoughts that do nothing and have no power – into a kingdom atmosphere filled with miracles, signs and wonders. Here is an excerpt of the prophetic words released at our October 14 Sunday service. Read these prophetic words out loud to yourself and allow the Holy Spirit to bring deeper impartation and revelation in your heart. "You have entered into the cry of heaven and earth for the revealing of the sons of God. You have accelerated that process. As I reveal Jesus to you, then your life is also being revealed. My glory is in you. I am bringing together the external and internal hearing of My word in your heart. There is an increase of acceleration in the earth. And you can feel that tension. I am shaking everything out that is not of Me. I am bringing it to an end. I am revealing Christ in you. Enter into My hope." "I have penetrated your atmosphere and penetrated your destiny. What I have said will be, will be. For this is My reign. This is My destiny. This is My glory in you. Reflect Me. Reflect who I am. This is the day that I have made; rejoice and be glad in it. Spread My joy. Spread My peace. Spread My word. Spread My strength. Spread My glory. Spread My courageousness. Spread My boldness. For you are one as a people." We are Christ revealed. Break down the walls. Push back the dark. Light of the world. There is a stirring in the spirit, heaven. Something holy, can you feel it heaven. "I am flooding you. I am flooding you with My majesty and power so that you will go forth as My word to the earth. The earth will not be flooded unless you are flooded with Me. Be flooded with Me for I am your God and I am with you." Let a mighty flood come from us and flow through us. And flood the earth. "You have stepped into a place of holiness and righteousness. I created the earth, then I put man in the earth. I gave it to you to rule and dominate. I have positioned you and given you the authority. And I am doing the very thing that you have asked. You have the authority to declare that “FEAR HAS TO GO!” “DARKNESS HAS TO RETREAT!” Release your voice of authority this day. Flood the earth with My word. Wherever you go I will breakforth in brightness. I am drawing you together in unity and causing you to rise up. I am glorified in your midst." "You are young. You are old. You come from this nation and that one. But I say that you are one. You come from here and you come from there. I say that you are one. I have made you one. There is no longer division or separation about you. Whether you come from this place or that place – I say that you are one. I have made you one. You will go forth in My power. And go forth in My might. For I the Lord have made you one. This is a NEW DAY and this is a NEW TIME – this is a day of unity. This is a special time. This is My appointed time. The former and the later rain – I have made you one. Yes, I the Lord have made you one." The strong reoccurring word in this prophetic flow is that God Himself declares that HE HAS MADE US ONE. It is by His hand and His strength. It is for His purposes and for this time. Let go of all thoughts of any kind of separation among us. God has MADE US ONE! This is His appointed time for us to be unified by His power and Spirit. It is not the working of man but the hand of God. It does not matter that our background, culture, experiences may be different, we have been made one for this time for His purposes.